Characterized by one editorial assistant as “daring work indeed,” this is a no-holds-barred look at one small portion of black American life. OBI wrote this piece mostly in dialogue. It is set in present day Chicago. The main character, Piano Man, tells his part of the story from the second person viewpoint. The foil character, Juke, tells his story from the first person viewpoint. The mix of viewpoints prompted Obi to call the technique Literary Cubism. Piano Man and Juke are both in their sixties. The story opens with them playing chess at Juke’s house and talking about old times. They were members of the same jazz quartet. Juke confronts Piano Man with photographs of Piano Man making out with a white woman. Piano Man can’t remember when they were taken. When asked where the pictures came from, Juke says they were found under the bed of another now deceased friend of their’s named Dempsey. Juke then admits for the first time in their friendship that Dempsey was his half-brother. He explains that his father had had an affair years ago, and that Dempsey was the result. Dempsey was put up for adoption, and when his adoptive parents died, he looked for and found his birth family. Piano Man was nonplused that Juke had kept this information from him all these years. They discover things about each other that they had not previously known. In particular, Juke learns that Piano Man had sexual affairs with the wives of all the other members of the quartet, including his. SATAN’S ANVIL is fraught with twists and turns, rich in gritty language and images. 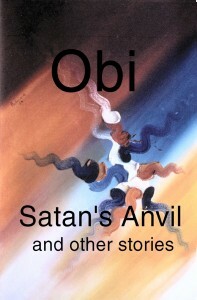 With the other stories in this collection, this will likely be one of his fans’ favorite works, Obi at his finest.